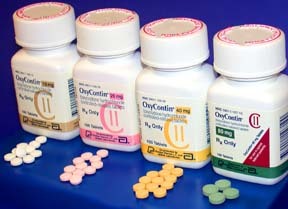 Oxycodone Side Effects are typically mild and manageable for patients who use the medication as directed. The most common side effects include nausea, drowsiness and constipation. You should not drive or operate machinery on this medication until you are familiar with how it affects you. If you attempt to take this pain reliever in higher doses or use it more often than recommended, you may experience more severe side effects including serious addiction. Of these side effects, constipation, drowsiness and nausea are the most common, occurring in approximately 23 percent of patients. Constipation is a common side effect with many narcotic pain relievers and can typically be relieved with a stimulant laxative and high fiber diet. Nausea may be eased by eating regular meals. Dizziness and faintness occur most often when patients rise from a reclining position. You can lessen these side effects by rising slowly and moving to a sitting position before you stand. These side effects of oxycodone are not usually a cause for concern. If your side effects worsen, persist or disrupt your everyday life, you should contact your healthcare professional. Addiction is one of the dangerous side effects of oxycodone. If you feel the urge to take more than the prescribed dosage of oxycodone medications you should contact your healthcare provider immediately. If your dosage is not adequate to control your pain, you should discuss this with your doctor. Never alter your dosage on your own. If you choose to stop taking Oxycodone, it is important that you discuss this decision with your doctor so you can work together to wean your body off of the drug slowly. If you have used Oxycodone illegally or abused your prescription, it is equally important to seek help in quitting the drug. Oxycodone is not an effective solution for all patients. This medication can lead to serious addiction and is prescribed with caution. If you experience chronic pain that requires a constant method of relief, however, you may benefit from appropriate use of an oxycodone medication.